The Fleischmann Planetarium & Science Center is a digital planetarium and science center that forms part of the University of Nevada, Reno and Extended Studies and is open to the public. Built in 1963, the Fleischmann Planetarium was the first planetarium in the country with a 360-degree projector that could provide horizon-to-horizon images through time-lapse photography. Today, the planetarium features a dome theater that offers daily digital planetarium shows and public star shows, educational and community outreach programs, field trips and observatory viewing at the Redfield Campus of the University. 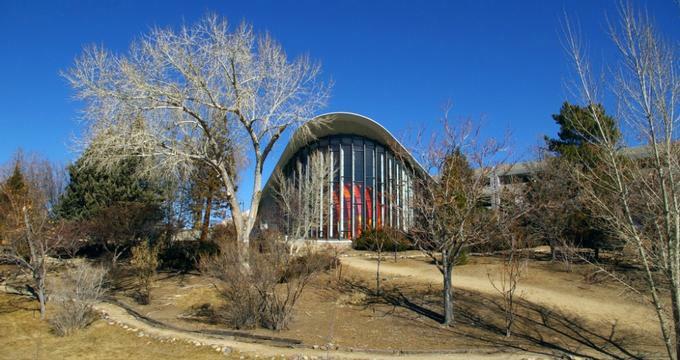 The Fleischmann Planetarium & Science Center is housed in a building shaped like a hyperbolic paraboloid that was designed by world-renowned architect Raymond M. Hellmann and is listed on the National Register of Historic Buildings. Founded in 1963 as the Fleischmann Atmospherium-Planetarium, the Fleischmann Planetarium and Science Center was the first atmospherium-planetarium of its kind in the world. Designed by Reno architect Raymond Hellman in the shape of a striking hyperbolic paraboloid, the unique facility could mimic both day and night conditions. It could also project a full range of atmospheric phenomena, including cloud formations, rainbows, and thunderstorms with a 360-degree projector that projected images of meteorological events on the inner surface of the dome. This device, the first of its kind in the country, could provide horizon-to-horizon pictures through time-lapse photography. Following the death of gin industry tycoon Max C. Fleischmann in 1951, the Max C. Fleischmann Foundation funded the planetarium, which was named in honor of Fleischmann’s parents. The building was beautifully restored to its former glory in 1976 and listed in the National Register of Historic Places in 1994. The Fleischmann Planetarium and Science Center features a variety of interactive exhibits covering the earth, moon, solar system and deep space, digital dome movies about science and space in the state-of-the-art SciDome, and a variety of educational outreach programs. The Exhibit Hall is at the center of the Fleischmann Planetarium and Science Center and offers ever-changing hands-on and interactive displays, along with immersive permanent exhibits on space and science. Exhibitions include ‘Living in Space,’ which showcases what the Earth looks like from orbit and how human beings have adapted to living in space. The ‘Our Earth’ exhibit takes an in-depth look at the earth about the solar system and the unique conditions that make life possible on this planet. ‘Our Moon’ shows a detailed study of the lunar surface of the Moon and how humans have studied this planet with the help of robots. ‘Our Solar System’ offers a panoramic view of the other planets around the Sun, along with their moons, asteroids, comets, and minor planets. This fascinating display features a meteorite collection, including an enormous one-ton Quinn Canyon meteorite. ‘Deep Space’ takes visitors on a journey into the cosmos with high-res images, videos, a large-scale structure of the Universe, and a state-of-the-art black hole simulator. The ‘What's Up’ exhibit is a stage for short-term and temporary or traveling presentations of current space science projects. The Fleischmann Planetarium and Science Center offers a range of educational and community outreach programs that are based on science, technology and the world around us for visitors of all ages. Programs include planetarium field trips for scholars and students with a focus on increasing interest in atmospheric and space science and related fields. The Planetarium also offer star-gazing opportunities in the evenings where visitors can get an up-close-and-personal look at some breathtaking constellations. The Fleischmann Planetarium and Science Center is located on the campus of the University of Nevada in Reno and is open to the public from Monday through Thursday from 12:00 pm to 8:00 pm, Fridays from 12:00 pm to 9:00 pm, and weekends from 10:00 am to 9:00 pm. The Planetarium has a Science Store, which is open during museum hours and sells a variety of science and technology-based items, gifts, books, and other trinkets.